After watching the British film ‘Brick Lane’, the story of a Bangladeshi teenager’s relocation from her home land to London and her entrance into an unsatisfying arranged marriage, I felt compelled to do some research into what I had just seen outside of the fine performances and the beautiful cinematography. 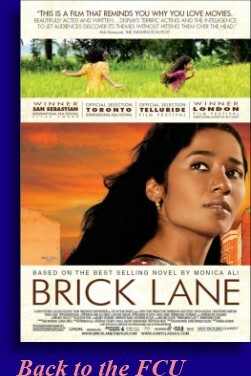 ‘Brick Lane’ was first a controversial novel by Monica Ali, A woman of Bangladeshi descent, with the controversy surrounding how the people who were the subject matter of her novel felt they were portrayed, a controversy which has carried over to the film. Though I find protest of works of fiction peculiar, they are just stories after all, I do take the protesters concerns seriously considering that these are their stories that we are seeing, with this film being my introduction into this life. Book burnings of any kind, however, are generally a bad idea and you might want to chill on that. I’m just saying. I do believe that those who are opposed to the book and the film should give the viewer or the reader the benefit of the doubt and hope that the audience can recognize that these are individual characters and that their lives are unique to them, and that these are not representative characters, or at least that’s how I viewed it. Now being a Black person in the United States I fully understand how a negative image can automatically become THE image. Hell, Black people are still trying to recover from ‘Birth of a Nation’ just to a name a few, but that’s on those individuals as I like to think that I have the good sense to see a work of fiction as just that. The film opens in Bangladesh where young Nazneen and her little sister Hasina frolic in the fields unaware of a burden that their mother is bearing that will cause her to take her own life. In the fallout from this tragic event the girls father will eventually shuttle Nazneen off to London in an arranged marriage while her strong headed and willful sister stays behind, though the two stay in close contact through frequent letters. Twenty years later, the time being the early part of the 21st century just prior to World Trade Center disaster, Nazneen (Tannishtha Chatterjee) is the depressed mother of two young girls and the wife to Chanu (Satish Kaushik), a man who is blustery, pompous and self-important, but also a man who takes great pride in taking care of his family and treats his wife with respect. It seems that Nazneen has never truly loved Chanu though she has dutifully performed her wifely duties over the years and often take breaks of fantasy through the words of her sister as she also dreams of one day being reunited with her. In an effort to bring more money into her struggling household, Nazneen does some sewing which gives her exposure to the young handsome and idealistic Karim (Christopher Simpson), the delivery boy she’s has admired from afar for some time, and the two embark upon a somewhat unwise sexual affair. This affair has a profound effect on Nazneen as it has opened eyes to many things beyond the simple physical pleasure of the act itself and has given her a sense of self awareness. Karim might want to put whatever that is in a bottle and sell it so we all could get some of that insightfulness. There are repercussions as well, somewhat, that also give Nazneen a clarity into some things that she will struggle with including learning about her sister, her religion and her life in general. Directed quite skillfully by Sarah Gavron, ‘Brick Lane’ is a film that is lovingly shot and contains some of the most beautifully framed scenes and exquisitely lit images that you’ll ever see. It is really a nice looking film. The beauty of the look of the film is punctuated by a pair of very solid performances with the Ms. Chatterjee as our protagonist delivering a three dimensional character with a quiet strength whose actions we can understand, though we might not agree with. A special note has to go out to Statish Kaushik who takes the unenviable role of the husband and instead of making him some kind of unlikable insensitive brute caricature, ala ‘The Color Purple’, he manages to make Chanu a real person with real flaws but also with a real heart. Now I found the morality of this film somewhat suspect, and the book may be clearer on this point but we have to go by what we see. What I got from this was that Nazneen having this extra marital affair ‘reaffirmed’ her love for her husband and her devotion to her family? Even though infidelity is never a good idea, the only reason that it was palatable in the first place within this story was because we were lead to believe that she never loved her husband in the first place and was forced into this marriage, and if there was love there, we never saw it. This third act rings untrue to me because quite honestly she showed more love to Karim than she even showed her own children. Another thing I didn’t understand was throughout the film Nazneen wanted to get back to Bangladesh to be reunited with her sister, then she receives some disturbing news about her sister which I would think would strengthen her resolve to get back home, only to witness her come to the conclusion that Brick Lane, the London neighborhood where this movie takes place, is her home. This change of heart was apparently based on the whinings of her disrespectful and bratty eldest daughter. Perhaps there was some justification for this within the narrative of the film, but whatever that may have been, I apparently chose to reject it. ‘Brick Lane’ is a good movie, a very serious movie and a very well acted and well crafted film that ultimately left me a bit unsettled on how I feel about it. But despite these misgivings it is certainly a film that is deserving of some special attention.